The primary purpose of this chapter is to present techniques and strategies that can be incorporated in online courses to promote students’ use of self-regulated learning strategies. 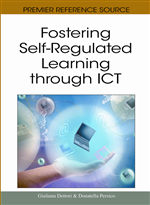 In addition, the authors discuss why self-regulated learning skills are particularly critical in online learning environments, present a model of self-regulated learning, discuss issues related to measuring self-regulated learning, address the issue of whether or not self-regulated learning can be taught, and discuss why online learning environments are ideal environments to scaffold self-regulation. The authors present several strategies and techniques they have found successful for promoting self-regulated learning that can be readily incorporated and implemented in online courses. These strategies are organized by the three main components of the Self-Regulated Learning Model: Executive Processing, Cognitive Processing, and Motivation. The chapter concludes with a scenario that represents an idealized model of how to promote self-regulated learning in an online learning environment by employing an intelligent tutoring component as a tool to support students’ use and development of self-regulated learning tactics and strategies.